Is Genesis becoming a theme builder? Does author authority on topic matter anymore? It sure has been good to sit at my desk this past week. It’s the only normal thing in my day right now. The house remodel hoohaa continues, you know, all the stuff that was supposed to be completed prior to me moving in. But I’ve been able to get a lot done and I want to share a bit of it with you. One of my clients sold her very profitable site last year. Then she took my Scratch to Published live training before setting up her next money maker because she wanted it right from the get-go. It really doesn’t matter how long you’ve been blogging. 90% of my clients are suffering from self-taught syndrome. Taking a class that is uniquely tailored to you and your site is the fastest way to start making money online. She now hires me to do a turnkey installation on all of her new passive income sites. She installs the theme, adds all of the content and SEO, and then we do a quick live session to launch, including all of her Google connections and other 3rd party connections. I have another client who is now on her 2nd passive income site and she is in the process of filling out our Site Launch Checklist. I’ll do a turnkey install for her this week and she’ll be off to the races with content and SEO. This past week I also did a few loyalty audits for previous site audit clients. They get a checkup every 12-18 months. And good thing too!!! Not only has security and performance things changed, but some items had been altered on their site by plugins or the host. We breezed right through those audits and I was able to fix and tweak most things right on the spot, or within just a few days after our live chat to discuss some changes. And, we’re wrapping up some really big projects that were started in August while I’m opening a couple of projects that will go through the end of the year. One of my clients has about 15 sites and we’re sorting out how to reduce those and merge content while protecting her SEO. The key to making this a stress-free project is in all the planning up front. We ensure we have a clear overall picture and we talk through any caveats. Then I make a to do list and we both know what we will be doing and in what order. That way, we breeze through the work. Sure it takes time to clean up 15 sites. But it’s a whale of a lot easier when you have a well thought out plan! Ready to Get Your Site Secure and Speedy and Making Money? Yes, there’s still room on the waitlist to get your site project done this month. So, come on!! See my Site Services page for info and request forms. This past week I also met live with two of my Site Audit Plus clients to go over errors and warnings they found in the new Google Search Console interface. It shows us WAY more info than the old interface, and I’m glad for it in one way. Some of those issues are things I teach in the DIY SEO course. They are not actually issues. The data is reflecting the settings in the Yoast SEO plugin. I know a lot of folks take that course and just click the buttons to set it up like I show in the screenshots. All the info is there about what that setting does, and reading it will help you make sense of what you’re seeing in Search Console. I’ll also be covering those things in the new Search Console course. I’m meeting with 3 clients over the next 2 weeks to take screenshots of examples of the types of things you’ll see in those Search Console graphs, and that should help you make sense of it all. The main perk you get is truly understanding the SEO on your site and how to work with it to make Google happy and bring yourself more traffic. After all, that is the bottom line, right? I’ll believe this when I see it. Matt Mullenweg, the co-founder of WordPress and the lead dev on Gutenberg, announced plans for the upcoming release of WordPress 5.0. It’s either Nov 19 or Jan 22, nobody can really tell. In the article he also names all of the folks who will be monitoring and heading up different parts of the release. He’s also taking a lot of flack over his remark about the unknown unknowns that might plague the release. There will also be a new TwentyNineteen theme when the 5.0 release goes public, and it will be fully Gutenberg compliant. Devs and folks in the cyber security community have been begging WP to stop including the latest default theme in major releases. Nobody much uses them, and they just put another potential security hole on your site. So, when we do update, that will be the thing we delete. But, it may be a good theme for designers and such to use on sandbox sites to test Gutenberg. And if you want to read more on the public opinion about the 5.0 release schedule, see WPTavern’s take on it too. I’m still advising that we don’t use Gutenberg when it rolls into the core. We want to give it more time to mature, and more time for the plugins we rely on to become Gutenberg compatible, as well as time for our themes to do the same. I’ll have more details for you on how I recommend we turn it off, as there are several plugins available. But I can’t fully test them with the Gutenberg plugin. I have to wait for the beta release with Gutenberg in the core. Matt has also released a post with his vision of Phase 2 for Gutenberg, which they will start on soon after the 5.0 release. It will be a full theme editor. And this is what they had in mind all along. What we’ll be getting in 5.0 is just the text editor portion to get us used to the whole idea of putting everything in a block. So, will this move do away with all the theme builders we have now? What I do know is that they will either have to adopt to Gutenberg or die, because that’s the way everything is going. 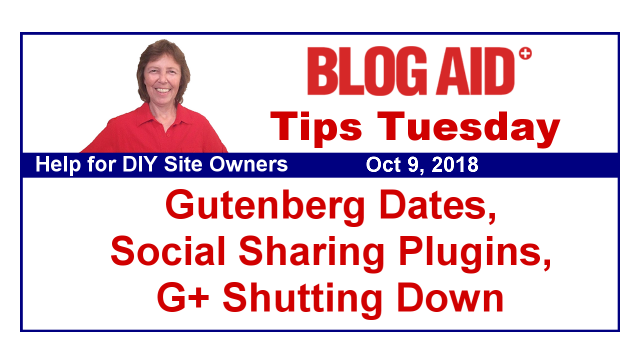 You may recall in a previous Tips Tuesday that I was delighted to see an update from the Genesis team with their status on Gutenberg preparations. And it looks like they may actually leapfrog WP and become more of a theme builder. That’s actually the smartest thing they can do. Genesis has always had super clean code. But they have also always required hiring a designer to change things up. Then Catalyst, Dynamic, and Beaver Builder made page builders for Genesis. That’s cool, but it trashed the clean code and made it bulky. I think there will always be a need for pro designers. But, I also think having some sort of DIY for Genesis that keeps the code clean will open them to a bigger market. And with Gutenberg Phase 2 headed that way, it only makes sense to adapt and grow at this point, going in this direction. Well, hey hey, look at this all of you who use the Scriptless Social Sharing plugin!! Natalie requested a new feature for adding a Pinterest description to the shareable image, and Robin, the developer, included it in the latest release. I want to thank Site Audit Plus client Lisa Rollins of Stitch in Progress for the heads up on this new feature. I just love our private Facebook village for learning about things like this. I’ve been seeing a lot of buzz on this plugin as a replacement for Social Warfare. I sure would like to hear your opinion on it if you do. Please feel free to leave a comment here on the blog or anywhere you see this post online. Google is dedicated to remaining the top search engine. And they are putting their money where their mouth is – to the tune of $9 billion. That’s how much Google will pay Apple to remain the default search engine on Safari. Of course, it’s all about ad revenue. But, for most of us, it means that doing our SEO in a way that makes Google happy is a win-win and we get more traffic to our sites. Why block anything in robots.txt? If you listen to some top SEO folks, they will tell you to not bother with a robots.txt file at all and to let Google crawl everything on your site. Not a one of those folks does performance and security for a living like I do. Google is not the only bot chewing on your site. And even if it were, there are areas that no bot has any business being in. I don’t mean to be gross, but if you could see what I see in site audits, you’d realize that your hosting account looks like a roach infested apartment with bots chewing on everything. But, things change. And Google bots have evolved. And I’m rethinking some of the settings I suggest in robots.txt, especially in light of the reports we are seeing in the new Google Search Console interface. The fact is, robots.txt is just a suggestion for bots. It’s not the law like .htaccess is. And ill-behaved bots will just blow past those suggestions and do what they want to do anyway. So, I’ll be doing new tests with different directives and watching what happens with the bot crawls. Those tests will take a couple of months, so these are not changes we’ll be making any time soon. I’ll keep you posted. I first came to know Mark Traphagen on G+ when he was talking a lot about Authorship and Author Rank that Google was pushing at the time. In this post, Mark gives a brief history of Authorship and whether your authority on topic as an author still matters to Google. But you’ll want to read this post for all the details. I thought about bringing back my course on setting up authorship, but it’s directly connected to your G+ account and there’s been news on that front too. Over next 10 months, Google will be phasing out G+ and the way all the apps that are connected to it. They will be featuring a new, more secure connection for Apps through their latest invention, Project Strobe. It connects everything via API keys, which are encrypted, and that’s most definitely the way you want to connect things these days. The main reason they are killing G+ is because they say so few folks use it these days. In typical Google fashion, they build something lots of folks love and is easy to use. And then they make it so hard to use that folks drop it. And then Google kills it because no one is using it. That’s what happened to authorship and YouTube Live as well, and 100 other things they have released. But, that official press release most certainly doesn’t tell the whole story on this. Here’s another post on The Verge about Google’s major personal data leak. It happened this spring, yet they chose not to disclose that fact to the affected users, or anybody else for that matter. You may recall the same sort of issues have been plaguing Facebook all year. I think this sort of thing, as well as the GDPR lawsuits, are making all social media platforms have to straighten up and play right with what they are tracking and who that info is shared with on purpose, and doing a way better job of securing that data. And on that note, Facebook is following in the footsteps of both Google and Microsoft and offering a type of cookie that beats ad-blockers. It’s called a First-Party Cookie. If you use the Facebook Pixel Tracker and run ads on Facebook, you’ll most definitely want to read this post about the changes. A2 Hosting (aff link) introduced a staging site feature nearly 2 years ago, but it never worked well. One of my webmasters dug into it with them, but gave up after a couple of months. When she says this new thing works, I’ll believe it. And, I’ll be creating tutorials on how to use it too, as this is a huge benefit for trying things out on your site without putting your live site at risk. Most non-managed WP hosts don’t offer a staging site, which sits in the root directory, below the public_html directory where your site files are, and bots and humans can get to it. The staging site can’t be found by bots or humans who don’t have direct access, so that’s what makes it so much safer for testing things than a sandbox site under a sub-domain or such. Now, I create sub-domain testing sites all the time, but I have a reseller account so each site is in its own cPanel. Even so, I don’t usually leave those test accounts up for more than 3-6 months, as bots and such will eventually find them no matter what. The other problem with setting up test sites in sub-domains within the same cPanel is that folks often forget about them and stop keeping them updated. That’s the #1 way sites get hacked. Plus, it’s drawing on the same hosting resources and it just puts your main site under too much risk. So, I sure hope this new staging site thing from A2 works well, as it will be a real bonus for so many site owners who are hosted there. Thanks MaAnna for the heads up to the live FB party! I will be there as always to keep my site running fast and efficiently! Thanks for another fascinating post! Fascinating that Google+ is going away but the explanation you gave makes sense. I’ll be interested to see if their new set up is better. Years ago Google decided they would force one login to all their products and they connected everything about a person through their G+ profile. I think undoing this thing is a lot bigger than folks realize, especially those who have Google My Business, or whatever they are calling it these days, connected to their G+ profile and biz page.